For many, the thought of Alaska in winter brings to mind cold temperatures, snow and ice. Predominantly because of the world-renowned Iditarod, a race with a tradition of more than 40 years along a trail that has been in existence for more than a century, Alaska winters also spark thoughts of mushers and sled dogs. The Iditarod takes these incredible athletes – of the human and canine variety – from Southcentral Alaska to Nome, located just 100 miles south of the Arctic Circle on the state’s west coast along the Bering Sea. 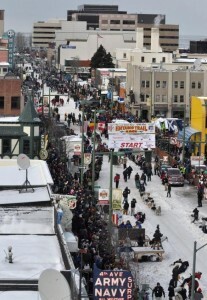 There are many great spots for spectators along the trail; but, thanks to the race’s ceremonial beginning in downtown Anchorage, a city with a population nearing 300,000, visitors can marvel at the events surrounding the start of the Iditarod without having to venture out into the unforgiving backcountry with the race’s brave competitors. Whether it’s your first Iditarod experience or you’re a veteran fan, understanding the history of the Last Great Race® can make the Iditarod’s unmatched display of athleticism, perseverance and celebration even more enjoyable for spectators. Following two shorter races in the late 1960s, the Iditarod Trail Sled Dog Race made its first trek of nearly 1,000 miles from Anchorage to Nome in 1973. Since then more than 1,900 mushing teams have crossed the Iditarod finish line, representing more than 20 countries and 23 states. 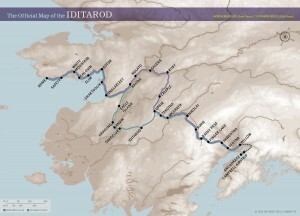 The history of the Iditarod Trail itself dates back to the 1920s when settlers fled to Alaska in search of gold. At the time, dog sleds were the only way to travel to outlying areas during winter, and the Iditarod Trail was born. Transporting everything from the mail to traveling doctors, the Iditarod Trail was a means of survival for many and has now been designated as a national historic trail by the U.S. Congress. And don’t worry about missing out if you are planning a trip to Alaska during the warmer summer months because you can still experience the state sport of dog sledding. Check out our Denali and Mt. McKinley Princess Lodges. Whichever you choose, our Princess Lodges make a great jumping off point for a scenic trip through Denali National Park and Preserve, where you can spend some quality time with sled dogs and learn about the important role these special canines play not only in the park but throughout Alaska.